(Nanowerk News) More than 300 elementary, middle- and high-school students received a firsthand look at the exciting science of nanotechnology when they attended NanoCareer Day at the College of Nanoscale Science and Engineering's ("CNSE") Albany NanoTech Complex on May 13. The program is designed to help prepare students for a growing number of nanotechnology-related career opportunities in the Capital Region and New York State, while also addressing the critical national need to stimulate students' interest in science, technology, engineering and mathematics. Equipment Evaluation and Support Specialist Steve Stewart conducted hands-on experiments with students and gave a demonstration on how to gown up in the "bunny suits" worn in CNSE's high-tech cleanrooms at NanoCareer Day. NanoCareer Day included presentations by CNSE faculty on the emerging science of nanotechnology and the career opportunities it offers; hands-on demonstrations explaining the applications of nanotechnology research and development; and tours of CNSE's world-class Albany NanoTech Complex, a $5.5 billion megaplex that is the most advanced in the academic world. 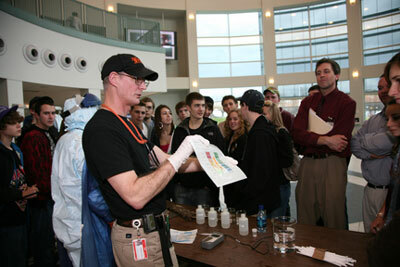 Schools participating in NanoCareer Day, and their counties, included: Algonquin Middle School, Averill Park Central School District (Rensselaer); Albany Academies (Albany); Galway High School (Saratoga); Marie Curie Institute of Engineering and Communications, Greater Amsterdam School District (Montgomery); Middleburgh High School (Schoharie); St. Catherine of Siena School (Albany); Academy of Christian Leadership (Albany); Division Street Elementary School, Saratoga Springs City School District (Saratoga); South Glens Falls High School (Saratoga); and Salem Junior and Senior High School (Washington).